Are you using a screen reader? Click here to view the navigation links for this site as a bulleted list. Library image #1951: Franconia Brook in the White Mountains National Forest. 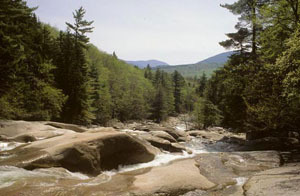 The United States Congress designated the Pemigewasset Wilderness (map) in 1984 and it now has a total of 45,809 acres. All of this wilderness is located in New Hampshire and is managed by the Forest Service. Nary a road blemishes New Hampshire's largest Wilderness, a bastion of hardwoods further insulated by a series of raggedly beautiful peaks that extend beyond the tree line and drain in-to the East Branch of the Pemigewasset River. If you make it past these welcome obstacles, prepare to enjoy New England backpacking at its best. The "Pemi" is so secluded, in fact, that I've run across many a moose, deer, even a fox and a black bear. Loggers removed almost the entire forest cover between 1890 and 1940, but 55 years of regeneration have eliminated virtually all signs of that era. The sharp, narrow Franconia Range and Twin Range form a horseshoe around the western portion of the area, with the Franconia threatening to challenge the Presidential Range for the title of Premier Peak. Mount Bond's crags and ledges demarcate the central northern boundary, and the Bondcliffs, just southwest of Mount Bond, quietly flaunt a vista across mountains and forests that show no trace of human interference. This is one of the few places in New Hampshire that can confess to boasting such a flawless view. The Wilderness flattens in the eastern portion, an area sometimes referred to as the Desolation Region for having withstood devastating logging operations. But despite the bad rap, the Desolation Region contains lovely Thoreau Falls, Ethan Pond, and Shoal Pond. The Lincoln Woods Trail leaves a parking lot on the Kancamagus Highway, then crosses the East Branch of the Pemigewasset River on a 160-foot-long suspension bridge. At that point it turns east to enter the Wilderness and become the Wilderness Trail, which continues to travel upstream for a combined total of about nine miles along the East Branch. This trail, possibly the most trekked upon in the White Mountains, follows an old railway bed. Camping is forbidden within one-quarter mile of the Wilderness Trail. At least nine well-maintained trails leave the Wilderness Trail to provide foot access to the area. The Appalachian Trail follows the northern border. Planning to Visit the Pemigewasset Wilderness? How to follow the seven standard Leave No Trace principles differs in different parts of the country (desert vs. Rocky Mountains). Click on any of the principles listed below to learn more about how they apply in the Pemigewasset Wilderness. For more information on Leave No Trace, Visit the Leave No Trace, Inc. website.